Earlier this year we reviewed the Oilatum Daily Junior moisturising body lotion - a thick lotion that both moisturises and acts as a barrier against further drying. The lotion is suitable for babies, children and of course, adults with sensitive skin. Building on the success of the body lotion, Oilatum have now launched a full range of children's bathtime and skincare products for sensitive skin - the Oilatum Daily Junior range. 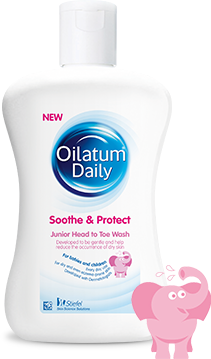 The Oilatum Daily Junior range includes Shampoo, Head to Toe Wash, Bath Foam and the original moisturising body lotion. Bathtimes really are a struggle in our house for my two girls who really want to use all the brightly coloured shampoos and body washes they see in the supermarket but when we are tempted, both girls suffer a lot with blotchy dry skin. For this reason, we always prefer to use bathtime cleansing products designed specifically for sensitive dry skin and this new range of Oilatum Daily Junior products is well suited to our needs. The Oilatum Daily Junior range is not free from all of the chemicals that are commonly associated with irritated skin - in fact the use of mineral oils in their products is one of the things that they boast because these can act as a barrier against other irritants and prevent drying of the skin through things such as central heating or air conditioning. We have found the Oilatum Daily Junior products to work well for us - I like the Soothe & Protect Junior Bath Foam best. To be in with a chance of winning this kit, all you need to do is to leave a comment below with a baby bathtime tip that you would share with other new parents. The competition closes on the 25th January. The competition is open to UK and Ireland residents only. The winners will be selected at random from all valid comments received by 11:59pm on 25th January 2015.